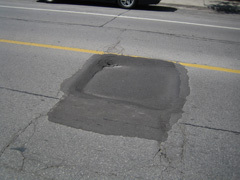 On Shuter St, between Parliament and Trefann, is a jumbo pothole, a road cave-in really, which seems to be getting worse. The roadway had been repaired here at least once before; the latest cave-in was simply marked with pylons for a few weeks before it was repaired, shortly after June 8 (pic #1). 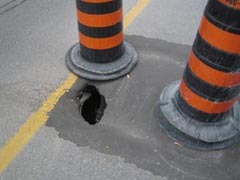 Within days, a substantially bigger hole re-opened in the roadway – see pic #2 (June 19). While blocked with pylons, this road cave-in forces car traffic to swerve dangerously into the bike lane and very close to the parked cars (watch out, cyclists). 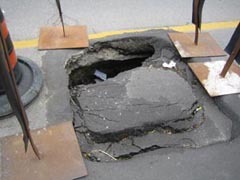 The road was repaired again, but within 24 hours started sinking again – see pic #3 (June 21). And yet another asphalt bandage was applied June 28. Still sinking – see pic #4 (Aug 6). 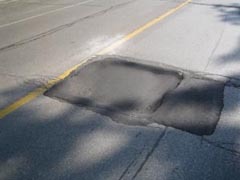 Don’t Trefann Court residents deserve better quality road repairs?